The Jamba Quiet Shield Blender is advertised as “big on power and small on noise” but does it live up to its promise? It is a newer blender brand and seems to offer nice features for the price but how does it perform ? 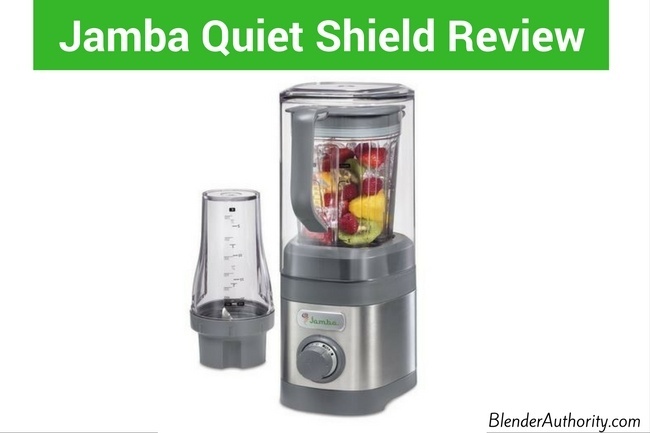 In this Jamba Quiet Shield blender review, I will detail all the specifics you need for deciding if this is the right blender for your needs. The popular Jamba Juice smoothie store chain introduced its Jamba appliances blender line in 2015 in a partnership with Hamilton Beach. Hamilton Beach is well known for manufacturing affordable, reliable blenders and kitchen appliances so the Jamba blender line is well built. Jamba introduced two blenders, the Jamba Professional Blender and Jamba Quiet Shield Blender. The Quiet Shield blender (Model 58916) targets an under-served need in the market which is providing a quiet blender for the residential consumer market (see our Best quiet blender guide for additional choices). While most blenders can be noisy, there are a few noise-dampened blenders on the market which are generally designed for the high-end commercial restaurant market. The Jamba quiet blender is one of the only “quiet” blenders targeting the lower priced consumer market. The main differentiating feature of this blender is the specially designed sound enclosure that dampens sound. It also has a relatively quiet motor base. The Jamba Quiet blender comes with a 32oz blending jar and a personal size 20oz jar with stainless steel blade. It does include a tamper which is a nice feature for blending frozen ingredients but you can’t use the tamper with the sound enclosure. I really like the versatility of the two jars that come with this blender. The 32oz pitcher is for making frozen drinks and standard fullsize blending tasks. Whereas, the 20oz personal blender jar works great for making small smoothies, food prep and grinding. Also, the 20oz jar is perfect for using with the quiet enclosure when making smoothies or protein drinks early in the morning. For controls, this blender uses a dial control with variable speeds and pulse. The variable speeds provides more precision for blending, chopping, mixing, pureeing, and grinding. It comes with a nice 5 year warranty and is well built by Hamilton Beach. Is has a compact, low-profile design so that it is easy to store and the height fits under standard kitchen cabinets. Quality features include a metal coupling gear (not plastic), soft start feature so you don’t burn out the motor at the beginning, and the jars are made with a heavy-duty BPA-free plastic. The Jamba Quiet Blend blender performs quite well with its 1.6 peak horsepower motor. The 1.6 horsepower translates to about 1200 watts of power if you are comparing it to other blenders. It can crush ice, tough fruits and vegetables. It might struggle a little trying to blend a lot of thicker ingredients at once which is why the tamper is very useful. It can easily make almond powder, oat flour, and certain nut butters. Consumer Reports tested this blender and said it performed “very good in overall performance”. Overall, user reviews and tests are very positive about this blender’s performance, size, noise, and accessories. Positives: The biggest positive is that this is the quietest blender in this price range. It is well built and provides nice controls and accessories. Another positive is this blender has a five-year warranty. It does well at blending shakes, smoothies, frozen drinks, salsa, whole juices, marinades and dips. Nice clean design with a size that is easy to store. Negatives: While it performs pretty well, some users mentioned it struggles a little with frozen fruits and vegetables causing it to leave small bits in your smoothie. The downside for me is that it has a 32oz capacity which is smaller than full-size countertop blenders so you are limited on the volume that you can blend. Nutribullet models can provide similar operating power as the Jamba. I would say that the Nutribullet Select is the closest competing Nutribullet model to Jamba Quiet blend. The Nutribullet Select has similar variable controls and container sizes. The main differences though is that the Jamba blender is quiet, has a tamper, and more power than the Nutribullet select. The Jamba Quiet Shield Pro blender is more expensive than the Nutribullet but is a better choice if you want a larger countertop blender. Also the Jamba has a 5 year warranty versus Nutribullet’s 1 year warranty. Overall, both are good performing blenders but go with the Jamba if noise is a major deciding factor for you. 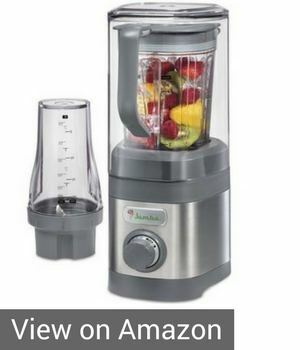 Since Hamilton Beach makes Jamba’s blenders, they have their own model that is very similar. The Hamilton Beach Professional Quiet blender 1500 was introduced in 2016 and has good reviews. It is a little “sturdier looking” compared to the similar Jamba Quiet blender in both size and performance. The Hamilton Beach Professional has a more powerful 1500 watt, 2.0 Peak Horsepower motor compare to Jamba’s 1200 watt 1.6 HP motor. It also offers 4 preset programs on the controls that the Jamba blender does not. For features and accessories, the two blenders are very similar. Both have 32oz pitchers with tampers and noise dampening enclosures. They also have the same 5 year warranty. The Hamilton Beach is a little louder maybe because of the stronger motor but it is still quieter relative to most blenders. The negatives on the Hamilton Beach Professional blender versus Jamba Quiet blender are: 1) The Hamilton Beach is slightly more expensive, 2) It only comes with the 32oz pitcher and not the 20oz personal jar and 3) The Hamilton Beach is a little noisier. These are minor differences that should be considered when comparing the two models. Click here to see the Hamilton Beach Quiet blender pricing and specifics. Similar to Jamba Quiet Pro Blender, the Ninja Professional blender BL660 offers both a full-size pitcher as well as a single serve container. Although, Ninja’s 72 oz container is much larger than Jamba’s 32oz container. The Jamba has has a slightly stronger 1200 watt (1.6 horsepower) motor versus Ninja’s BL660 1100 watt motor. For performance, the Ninja will blend hard ingredients well but some people feel that Ninja’s total crushing blade doesn’t purify certain ingredients as well as a traditional blender blade design like the Jamba blender blade. Although, the Ninja extraction blade that is used with the personal-size Nutri Ninja cups works extremely well. If trying to decide on the two, I would go with the Jamba if you really want the quietness and I like tamper. Otherwise, the Ninja is a little more affordable and a good choice if you want the larger capacity pitcher and noise isn’t a factor for you. Many people who are looking for a quiet blender will compare Jamba Quiet blender vs Vitamix’s Quiet One. You can read how I ranked both blenders in my top quiet blender article. Vitamix blenders are much stronger than the Jamba blender and Vitamix provides larger capacity. If you want pure power and you plan to use the blender for a wide range of blending tasks then Vitamix blenders are hard to beat (See Best Vitamix buying guide). Although for the price, the Jamba Quiet blender is an good choice as a smoothie blender that can easily handle smaller blending tasks with its Vitamix-like tamper, variable speeds, and ability to change between a personal size cup and 32oz pitcher. Honestly, the Vitamix Quiet One is built like a large commercial strength blender compared to the Jamba Quiet blender’s compact, residential blender design. If you want want a quiet blender with the full strength of a Vitamix blender, then the Blendtec Pro 800 is my favorite choice. Jamba Quiet Shield Pro blender is an excellent alternative to noisy blenders. It is my top choice for best value among quiet blenders and one of our favorite personal blenders. Besides its quiet operation, this blender is also constructed to last long, has dishwasher-safe parts, a powerful motor, and a generous warranty. The different containers provide the option of working both a single-serve and top loading blender. The only downside is the container capacities are smaller than typical full-size countertop blenders. It isn’t as powerful as a Vitamix or Blendtec but it is a good blender for the price. If you have any questions or feedback then please leave a comment below.